This recipe comes to you by way of Leslie Cerier, author of Going Wild in the Kitchen and Gluten-Free Recipes for the Conscious Cook. For more deliciously healthy recipes visit Leslie’s blog or website. 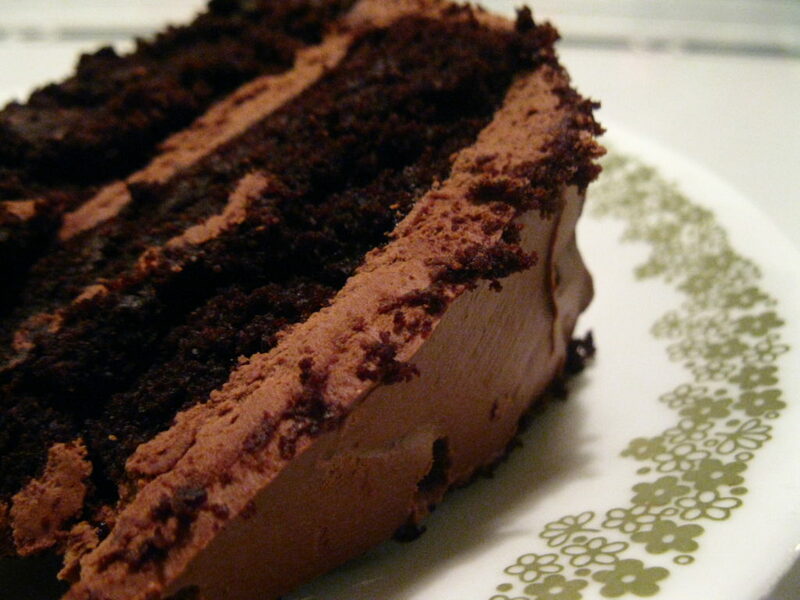 Loved by vegans and non-vegans alike, this rich chocolate cake is the one Leslie usually makes for birthdays. She suggests serving it plain, drizzled with Hot Fudge, or frosted with Vegan Chocolate Mousse. 1 1/2 cups dark chocolate chips* or 5.3-ounce dark chocolate (70 or 72%) broken into 1-inch pieces (1 ½ cups) * Fair Traded chocolate is strongly suggested. 1. Preheat the oven to 350°F. Lightly oil a 9-inch cake or loaf pan and set aside. 2. Combine the flour, baking powder, and salt in a large mixing bowl and set aside. 3. Place the flaxseeds in a blender and grind to a powder. Add the juice, oil, maple syrup, and vanilla, and blend well. 4. Heat the chocolate chips and soymilk in a 1-quart saucepan over low heat. Stir constantly about 3 minutes, or until the chocolate melts. 5. Add the melted chocolate and flaxseed mixture to the flour mixture and stir well to form a smooth batter. 6. Pour the batter into the cake pan and bake 40 minutes, or until a toothpick inserted in the center comes out clean.?7. Let the cake cool 30 minutes before removing from the pan. Serve plain or frosted. Omit the soymilk and use 1 ¼ cups juice. Melt the chocolate in a double boiler or in a skillet over low flame stirring constantly. Also, you can substitute other flours. If you like, use all spelt flour and subtract 25% liquid from the recipe above. Or if you want to add more calcium and iron and use some teff flour, you may substitute up to 25% teff flour for the whole wheat pastry flour. Either way, this cake will please everyone.